The Empire State Building rises unchallenged by neighboring skyscrapers, it's got the observatory and, since 1976, the changing lighting scheme. For visitors (and many locals), it's the ESB for the win. The Chrysler showboats its gloss and gargoyles. Yes, Chrysler, we love you, too. 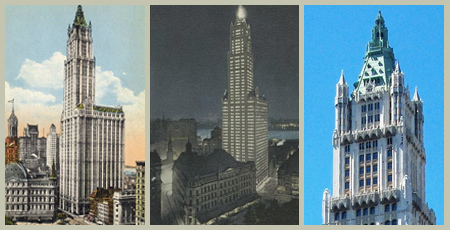 The Woolworth Building isn't quite the peacock of its showier cousins. But it's a beauty that's got it all and knows it. Opened April 24, 1913, Frank Winfield Woolworth's Cathedral of Commerce celebrates its 100 birthday next month. Designed by Cass Gilbert, the 792-foot Gothic tower still beguiles. It was the tallest building in the world until 1930, but its appeal isn't mass, it's the balance of the horizontal and vertical lines, the setbacks, the creamy terra-cotta cladding (15 million pounds of it), the glorious lobby that makes room for the antic mini-figure of Gilbert holding a mini-Woolworth building. Since 2001, access to the building is restricted, even to its lobby. In celebration of the centennial, Woolworth Week, April 22-25, will include talks, receptions, and—hooray!— tours of the lobby, given by the manager of the building. Details are here. Also in its honor, the Skyscraper Museum has an exhibit on its history. 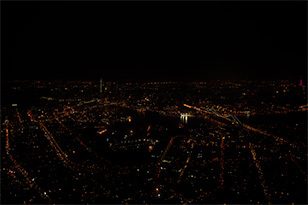 Scouting New York has interior photos, listen to a podcast by the Bowery Boys, and read The Skyscraper and the City: The Woolworth Building and the Making of Modern New York by Gail Fenske. MUG's own small tribute page is here. Some lucky people with enough fives and dimes will, before long, be able to live in the Woolworth. Sure, they can squat there. The Woolworth is always going to belong to New Yorkers.